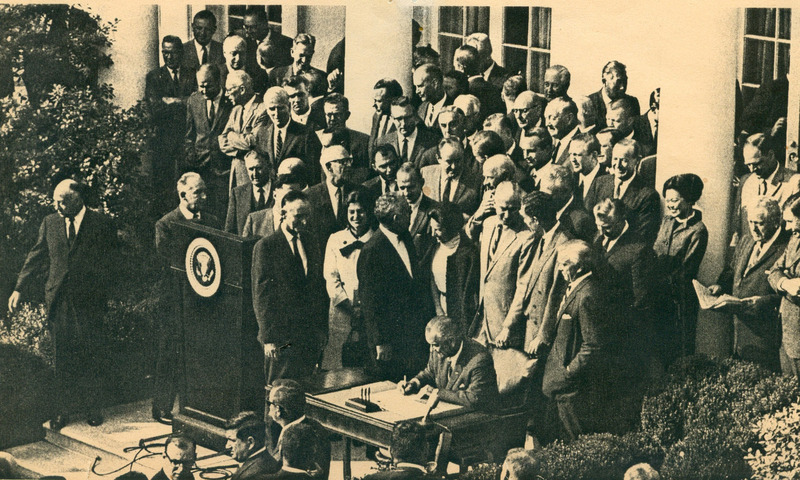 President Lyndon Johnson signs the legislation creating NEH and NEA. to sustain and preserve the country’s many artistic traditions.” Alongside other Great Society initiatives, its mission was to enrich the cultural lives of the American public by increasing access and opportunity, and in so doing to forge a national artistic landscape that was as creative, diverse and multifaceted as the country itself. Fifty years later the NEA struggles on, doing great work despite being the victim of an unrelenting and highly successful conservative assault on the public sector that began with the election of Ronald Reagan and continues to this day. The National Endowment for the Art’s 2015 federal budget allocation clocked in at a mere $146.021 million, which accounts for 0.012% (about one one-hundredth of one percent) of total federal discretionary spending. When, in 1981, Ronald Reagan’s Budget Director David Stockman proposed a 50 percent cut to the NEA’s budget, it was based on the conservative principle that federal subsidy of the arts amounted to government overreach and intervention and that this support should be provided only by private individuals and corporate philanthropy. Reagan’s election was the culmination of a long campaign by conservative and corporate America to roll back the progress made from The New Deal to the Great Society, to break the unions, to destroy the social safety net and undo the government itself. It in no way minimizes the efforts of of the NEA Four (Karen Finley, Tim Miller, John Fleck, and Holly Hughes) to suggest that the ensuing Culture Wars and the moral outrage of senators like Jesse Helms was, as much as anything, a smokescreen. Controversy over cultural issues was used as cover to continue the Reagan Era pursuit of privatization and dismantling of the public sector, and continues to this day. The right wing of America may or may not actually care about immigration, abortion rights, marriage equality or Obamacare, but they care much more about breaking the government and privatizing everything. It is not difficult to connect the dots from 1980 to today, from Reagan to George Bush, Sr. to George Bush, Jr. to Boehner to Jeb Bush, Trump, Cruz and Rubio. The subject matter, the text, the script, changes over time, some of the faces change, but the agenda hasn’t. And they’re winning. We may win individual cultural battles, but when the war is over they will have won, with the government in shambles and the damage irreparable. Seen in this context, the arts is only a bellwether of the havoc being wreaked on America by corporations, fronted by rightwing politicians. The gutting of arts funding at the national, state and local levels left a gap to be filled by private mega-donors and corporate philanthropy. This has transformed the non-profit performing arts into a funhouse mirror version of America’s corporate sector. As of 2012, 55% of all philanthropic funding of the arts went to the 2% of arts organizations with budgets over $5 million. In practice, this imbalance means that the majority of arts philanthropy is a transfer of capital from older, wealthy white people to arts organizations run by other older, wealthy white people in support of art that speaks to their concerns and affirms their biases. Many of the large, established performing arts organizations in this country now look like gated communities of corporate executives. The non-profit performing arts sector is dominated by the same conservative, “free market” ideology that has come to define much of American life. The nation’s most influential arts management graduate program is funded by the ultra-right wing DeVos family; it is accepted as self-evident that the apex of Peter Gelb’s “spectacular mismanagement” of the Metropolitan Opera was, in the words of critic Terry Teachout, being “unwilling to demand substantial cuts in labor costs from the Met’s powerful unions.” Lincoln Center’s New York State Theater is now the David H. Koch Theater. In the absence of a meaningful commitment to, or belief in, the public good, all art – high, low, or otherwise – becomes merely entertainment product to be marketed to consumers. When we abandon the idea of the public good, we undermine our ability to create public spaces that are not marketplaces. This includes not only theaters, museums and concert halls, but also schools, libraries, and public broadcasting networks (as Sesame Street’s recent decampment to HBO reveals). The real crisis in the performing arts is the sector’s wholesale capitulation to a set of values that is inherently antithetical to the actual benefit of the arts to citizens in a democracy. We may live in an America that looks very different than it did in 1965, but the values on which the NEA was founded are as relevant today as they were half a century ago. The performing arts are proliferating outside traditional institutions; in this age of screens and solitude, audiences crave the live and communal experiences provided by DJs, dance battles, and immersive theater. Symphonies, operas, ballets, and regional theaters could avert their self-proclaimed crisis by opening up their doors – and stages – to more people; funders could give more equitably, not only to institutions that replicate their own image of themselves, but to artists and organizations that reflect America as it is today, and who are creating the America of the future. An unnamed artist attending Common Field’s 2015 Hand in Glove conference in Minneapolis was tweet-quoted as asking, “When are we artists and when are we everyone?” The answer, of course, is that artists are always everyone, we are members of a greater Public, and it is in acknowledging this that artists can create change. The best way to improve conditions for artists is to improve conditions for everybody. The best way to save the arts is to resurrect the idea that investing in the public good will not only serve us well today, but yield long term benefit for generations to come. Good idea to assess the state of play as NEA reaches the half century mark. I’d throw in two things for consideration that I see as positive developments. The first is the way Republicans began to use manufactured outrage over artworks once they saw how politically effective Jesse Helm’s attacks had been in rallying the Christian conservative base. Yet I can think of this tactic being used twice in the 21st century without much effect – by Giuliani over Sensation/Ofili at the Brooklyn Museum, and by Boehner and Cantor over Hide and Seek/Wojnarowicz at the National Portrait Gallery (http://www.motherjones.com/mojo/2010/12/john-boehner-wojnarowicz-video). Seeing how little difference support from social conservatives has made in Boehner’s trajectory since, and their growing impatience with the Republican tactic of manufacturing outrage (see response to Planned Parenthood hearings), you could even argue that this tactic has become counter-productive. The second is that that there are now significant alternatives for using taxpayer money to support arts organizations. The millage tax that voters passed in Detroit is now providing the Institute of Art with $23M per year through 2022. In Colorado, counties in and around Denver and Boulder banded together in 1988 to create a Scientific and Cultural Facilities District (SCFD) that taxpayers approved three to one, and which now provides $52M per year for scientific and cultural non-profits in their neighborhoods. That’s more than any state arts council in the US. As for your point about how much public money is channelled to the largest institutions, there’s a very interesting situation developing in Colorado. The SCFD is on the ballot for renewal in 2016, and appointed a task force to revisit the distribution formula across three tiers of large, middle-scale, and small institutions. The task force decided to make a slight reduction in the two-thirds of the total given to the big institutions and proportionally slight increases for the others, but a nonprofit was formed to make the case for giving smaller groups even bigger slices of the pie. On one side is the Denver Post (http://www.denverpost.com/editorials/ci_28818565/dont-fiddle-scfd-funding-proposal), which argues for maintaining the status quo and echoes those who fear perceived dissension in the ranks may put off voters, and on the other is the nonprofit, FACE, which is rolling out data that paints a picture of smaller groups growing in number and serving larger audiences of local, more diverse taxpayers who don’t necessarily go to the bigger institutions, and arguing that the formula should be adjusted to reflect such changes in cultural participation (http://www.face2016.com/facts-and-charts/). First off decide to not vote for anyone who doesn’t understand the workings of the NEA. I personally served on the Choral Panel for choral music for 2 years. I quote,Margaret Hillis, former director of the famous Chicago Symphony Chorus who received many Grammy awards for her work at that chorus, “How can we assist small choirs in Montana unless we evaluate and financially (very small amounts) unless the NEA assists them. We are talking that the best groups who warranted the support and oth er s who saw what was needed to gain the support. The NEA serves all areas of art with evaluations nd compensation when it us deserved. Members of service fields form the panels who make the decisions. We have some very ignorant people in this nation who can’t seem to comprehend supporting arts group yet in my town those people support a billion dollar football stadium that has 10 games a season. The Twin Cities is rampant with athletic facilities. They continue to spend without considering any logical budget for that aspect of our town. Ran into a problem this week though-had trouble finding money to redo Target Center for 100 million+++. The Republican party typically dislikes spending for the arts yet they love it when people from across the nation call us the cultural oasis of the nation. The arts community works for nothing, brings great art for us to enjoy on a shoestring budget. We will be gone when all people come to the realization that the athletic teams and their complexes are not sustainable nor desired for the masses. We need people elected that have common sense on their shoulders and politicians who see what is happening. Football stadiums are filled with the wealthy corporations not the common folk. It is as bother separation of the rich from the poor. Oh yes they worked hard to get to where they are but it was easy when they were there or they entered on daddy’s coat tsils. Just another are where a shift in thinking us going to have to happen. A brilliant politician who knows how to address this overall entertainment issue will get myvote. There are similar moves afoot in the UK, as tax relief is exchanged for grant-in-aid (funny to see various groups rebrand themselves as orchestras, for example, or to see the tax code define what it takes to qualify as an orchestra). I’m really curious, though, how much tax relief is claimed in the US on cultural (or just arts) ‘donations’. As I understand it – and I may well be wrong – the tax relief arrangement means that donors can give apparently large sums to favoured causes, and write off that sum 100% against tax liability (a way of exchanging cash for cultural capital). In essence, it’s a subsidy below the radar. The data on this would be interesting, though.